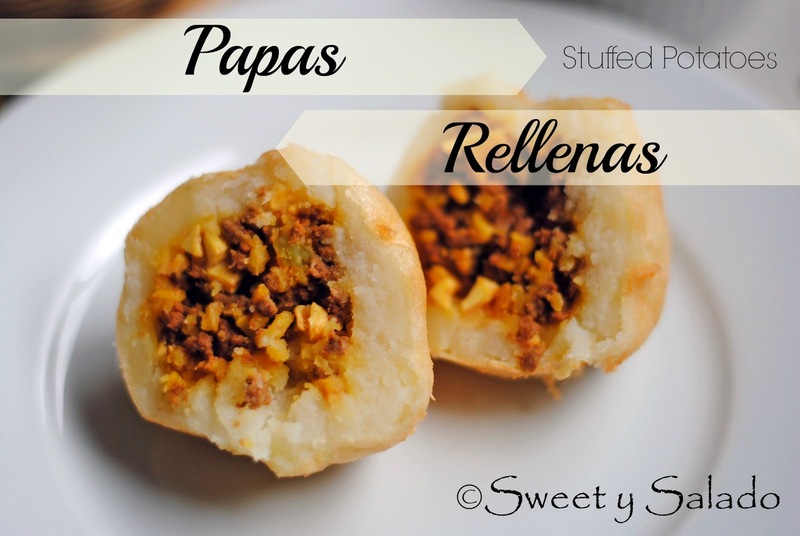 Colombian papas rellenas (stuffed potatoes) are one of the most popular appetizers in Colombia. Why? First of all because they’re fried. Secondly, because they’re stuffed with a guiso (seasoned sauce) very similar to hogao, and if you read my hogao post, you will know that it’s something very special to most Colombians. Thirdly, because they’re made with potatoes and what Colombian doesn’t like potatoes? And last, because they’re fried, I know that I had already mentioned this earlier, but eating and frying food in Colombia is almost like an olympic event. These potatoes are very similar to the Colombian empanadas (which are also fried) and are sold everywhere. 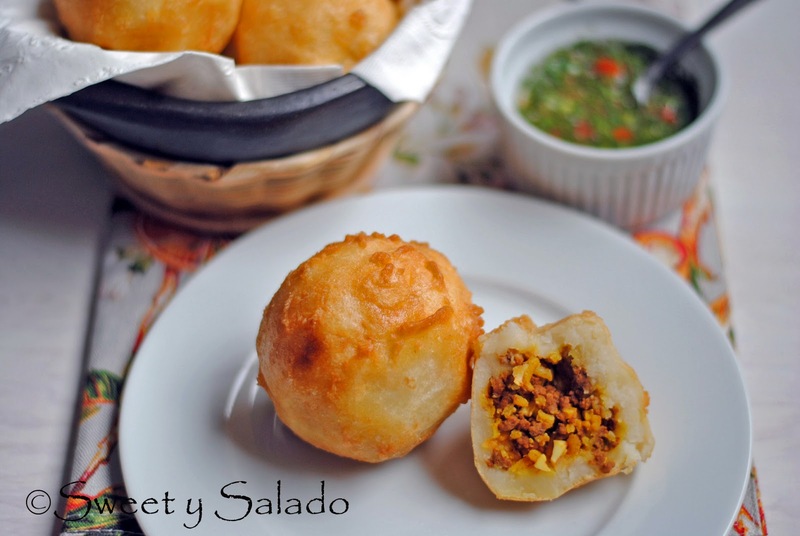 The best part is that you can enjoy them either hot or cold and the flavor stays the same because the potatoes don’t lose a lot of their texture, unlike the cornmeal used for the empanadas. The best way to serve them is with a side of Colombian hot sauce or Colombian green hot sauce, but I personally love them when I serve them with guacamole. Many of you had asked me for this recipe and since I usually don’t make or eat fry food at home, I had not been able to make them until I recently had the urge and finally made them. I even forgot how delicious they were. I hope you enjoy it. 1. Peel and cut the potatoes into small cubes. Put them in a pot, cover them with enough water and add salt. Cover and cook for about 20-25 minutes on medium heat or until soft. 2. Once the potatoes are cooked, drain them and put them back on the stove for about 1 minute to evaporate the excess liquid. Then put them in a large container and mash them. Put them aside and let them cool. Once cooled, knead them with your hand to make a smooth dough. 3. To make the guiso, heat oil in a large pan, add the tomatoe, green onion and garlic and cook on medium heat for about 5-7 minutes or until the vegetables soften. Then, add the ground cumin, the Sazón, and salt and pepper and cook for 1-2 more minutes. 4. Add the ground beef to the guiso and break it up with the help of a spatula. Cook the meat thoroughly. Taste for seasoning and add salt if necessary. 5. To make stuffed potatoes with boiled egg and rice (optional): Mix half of the amount of ground beef with the boiled egg and cooked rice. 6. To make the potatoes, put a small ball of potato in the center of a tortilla press covered with plastic and press to flatten it. You can also put the small ball of potato between two pieces of plastic and flatten it with a small saucepan, a dish or even your hands. 7. Add two tablespoons of filling to the flattened potato mixture and close it up with the help of the plastic bag making sure all the filling stays inside. Finish rounding up the dough with the help of your bare hands until you end up with a perfect ball. Repeat this process until you run out of potato and/or filling. 8. In a small bowl beat the eggs with the flour and salt. 9. Carefully cover each ball, one by one, with the batter and fry in enough oil at 350ºF (180ºC) for about 10 minutes or until golden brown. Remove them from the oil and let them drain on paper towels. 12. Serve them hot or cold with Colombian hot sauce or Colombia green hot sauce. Hola Diana, te escribo desde las Islas Canarias (España), hace poco que he descubierto tu blog y me encanta tanto tus recetas como tus vídeos con las explicaciones de como realizarlas. La semana pasada hice tu receta de tortitas o pancakes y me resultaron deliciosas, y hoy me he atrevido con tus papas rellenas y han sido todo un éxito. Seguiré probando más recetas tuyas. Muchas gracias y saludos.